Without hesitation the teacher reached down and picked up Zheng’s cheek skin, put it on his face, and instructed the boy go home immediately. 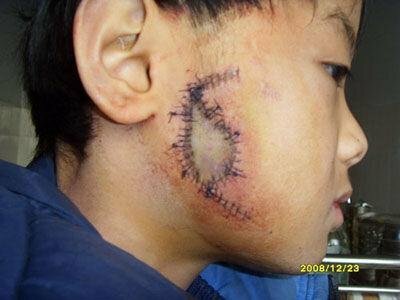 When the parents saw Zheng, they immediately took him to the hospital where it took 52 stitches to have his cheek sewn back on. Zheng’s father has reported the case to the police and is expected to press for damages.